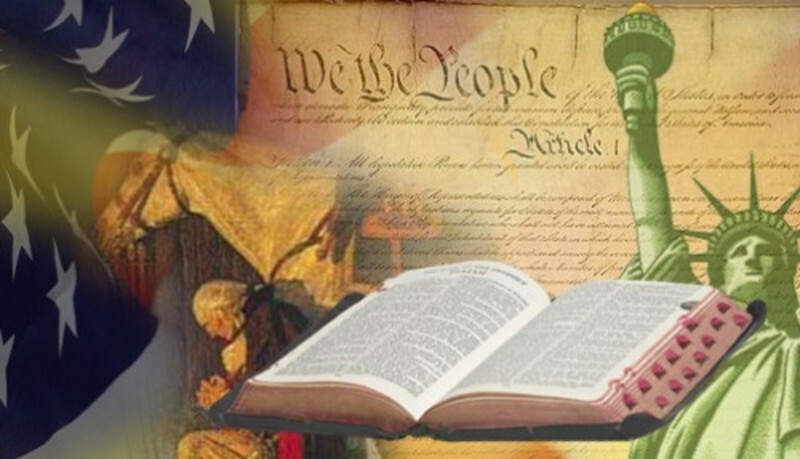 Is America a Godly nation? While some diversity in interpretations and of biblical details exists, our country still has a large base of peoples who are Christians. But a Christian Nation is one where the Christian influences are evident through the actions of the nation as a whole. It elects Christian leaders - or at least leaders who believe and adhere to the biblical principles. So how do we rate as a Godly nation? There can be little doubt that regardless of our nation's current issues, we are still the most Godly nation existing today. How Godly is that? How Godly? I think you will agree with me when I say swift change pretty much defines modern life. This rapid change puts up buildings, builds computers, and sends men and equipment into space. It also results in a growing gap in common experiences of the generations which in turn grows opportunities for challenges to our institutions and values and beliefs. Our imperfect world is stained with evil and injustice; where ruthless ambition generates passionate conflict to divide us as a people so that we can be manipulated. The ruthless ambitions of the ungodly depend on their ability to divide the country. A common tactic of today's political left is to refuse to debate issues because doing so will give some credence to their opponents. A common tactic of the right is to fain being insulted and hurt at being demonized by their opponents. These groups fight over issues - not because their justifiable, but because of ambition and power. We, as Christians, can change things to the good. We must learn to communicate - not just with each other - but with those we may sometimes consider "THEM". Those who belittle the bible do so so they can do things they should not without feeling shame. They may argue that there is no right or wrong or that the truth is dependent on circumstances. They will determine for themselves what is right or wrong - true or false. If you indicate this is not biblical, they may mock you for being so simple minded as to believe in a bunch of old writings by people who died thousands of years ago without a clue of what life today might be like. So how do we communicate with people who believe such things? By being Christian Soldiers - We'll call it aggressive goodness. "Endure hardship with us like a good soldier of Christ Jesus. No one serving as a soldier gets involved in civilian affairs - he wants to please his commanding officer." To put it in context, let's relate this to an event. "Jesus turned and said to Peter, "Get behind me, Satan. You are a stumbling block to me; you do not have in mind the things of God, but the things of men." This was a strong rebuke. We first must understand it was one that was needed. This rebuke was based on Peter's passionate (but maybe also "off the top of the head" politically correct) response about protecting Jesus from men when Jesus' mission from God was to die at the hands of men. He (Peter) was (inadvertently on his part) tempting Jesus to give up his mission - which was fully within Jesus' power to do so. We need to be careful and thoughtful of what we do, our actions, what we say - and not be too casual about them. Devoting ourselves blindly to the left or the right political movement is "of men" - not God. We must focus on Christ's agenda for our lives and look at the issues of the day individually - with discernment. We Must Understand the Battlefield - for we are on a battlefield, whether it seems apparent or not. "Finally, be strong in the Lord and in his mighty power. Put on the full armor of God so that you can take your stand against the devil's schemes. For our struggle is not against flesh and blood, but against the rulers, against the authorities, against the powers of this dark world and against the spiritual forces of evil in the heavenly realms." "Therefore put on the full armor of God, …." Stand firm …, with the belt of truth buckled around your waist, with the breastplate of righteousness in place, and with your feet fitted with the readiness that comes from the gospel of peace. … take up the shield of faith, with which to extinguish all the flaming arrows of the evil one. Take the helmet of salvation and the sword of the Spirit, which is the word of God. And pray in the Spirit on all occasions …"
To be affective in any battle, the troops must believe in "the cause". If properly armored, the soldier need not waste focus on himself, but can concentrate on the battle plan. With this fixed in our minds, let's review the armor of God. Let's look over our "self protection", so we can fight evil without fear. Throughout the New Testament Jesus makes statements which begin with the words, "I tell you the truth …". We read in John 1:17 that "…grace and truth came through Jesus Christ." There is such a thing as TRUTH. It is not relative or variable - it is THE TRUTH. We are to know this and wear "the Belt of Truth". Jesus is our example. Especially today we should be aware that our lives are not private. Our lives must be able to withstand the scrutiny of the world. Christians are to be demonstrations of the Truth. Col 3:8-10 tells us to communicate as follows: "But now you must rid yourselves of all such things as these: anger, rage, malice, slander and filthy language from your lips. Do not lie to each other, since you have taken off your old self with its practices and have put on the new self, which is being renewed in knowledge in the image of its Creator." The devil constantly attacks us with lies, accusations, and guilt. Without the "Breastplate of Righteousness", these will penetrate our hearts. Let's be aware of who we are in Christ Jesus. In 1 Ki 3:9 we have Solomon's request of God, "So give your servant (and us) a discerning heart to govern your people and to distinguish between right and wrong." Feet fitted with readiness that comes from the gospel of peace. Doesn't that sound cool. Let's make up our minds NOW to follow the Lord no matter what. Stand on The Gospel. Listen to the Holy Spirit. 1 Cor 15: 1-4 "But let me recall to you, brethren, the Good News (Gospel) which I brought you, … that Christ died for our sins in accordance with the scriptures; that He was buried; that He rose to life again on the third day in accordance with the scriptures." We must never consider giving up. What do we have if we give up our eternal souls? Our hope is built on faith - The Shield of Faith. 1 John 5:4-5 "For every child of God overcomes the world; and the victorious principle which has overcome the world is faith. Who but the man that believes Jesus is the Son of God overcomes the world?" Satan's target is your mind. He attacks with lies. The enemy wants us to doubt God and our salvation. We will wear the Helmet of Salvation" to protect us. 1 Thessalonians 5:8 "Since we belong to the day, we must be serious and put the armor of faith and love on our chests, and put on a Helmet of the Hope of Salvation." We have to trust in the truth of God's Word. Have confidence in the value of God's word. Learn and understand the bible's contents. Ps 149:4-6 "For the Lord takes delight in his people; he crowns the humble with salvation. Let the saints rejoice in this honor and sing for joy on their beds. May the praise of God be in their mouths and a double-edged sword (the Sword of the Spirit) in their hands." We are instructed on how to act on the battlefield of the world. To Pray is to go into Action. We are to maintain communication with our commander. We should seek prayerful guidance before, during, and after troubling discussions with those of opposing views. Remember also the bald face power of prayer emphasized by Jesus in Mark 9:29 where He, after removing an evil spirit from a young boy that the apostles could not remove, explains that there are some things that we will only be able to accomplish with prayer. Let's step up to some specific instructions for doing battle. Jesus' informed the apostles in Matthew 10:16, when He sent them into the world, that they would be " … like sheep among wolves. Therefore, be as shrewd as snakes and as innocent as doves." As shrewd as snakes and innocent as doves. OK - let's understand and use that. Shrewd means to be practical and to be given to an artful way of dealing with situations and people. For instance, when someone makes a statement you believe to be a lie - probe them with questions about their statement. This will often cause them to have to overextend their practiced lie and reveal their intended deceit or prejudice. Being shrewd is synonymous with being wise and wary and prudent in dealing with people. In Prov 27:12 we read: "The prudent see danger and take refuge, but the simple keep going and suffer for it." Translating Jesus' instruction to his disciples, we come up with: "Detect and avoid danger, while giving no provocation or offense. Be wise and harmless - always." RIGHT???? Noooooooooo! There is a sinful way of escaping danger, namely, when we are called to suffer for the truth but we decline it. And there is an escaping danger, without sin. For example, when we do not betray ourselves into the enemy's hands by rashness, nor betray the truth by cowardice. A better translation then: We must have the wisdom of the serpent so that others do not harm us. We must have the innocence of the dove that we may not betray the truth. "They (the Pharisees and Herodians) came to him (Jesus) and said, "Teacher, we know you are a man of integrity. You aren't swayed by men, because you pay no attention to who they are; but you teach the way of God in accordance with the truth. Is it right to pay taxes to Caesar or not? Should we pay or shouldn't we?" Christ answered wisely, verse 17, "Give to Caesar what is Caesar's and to God what is God's." Jesus was wise and told the truth - ignoring the false flattery. Reprove a person's sin, yet expressing love for the person, is another example of the mix of wisdom and innocence. In Leviticus 19:17 "Do not hate your brother in your heart. Rebuke your neighbor frankly - so you will not share in his guilt." Not to reprove sin - is to approve it. But this sword of reproof is a dangerous weapon, if not well handled. Reproof is a bitter pill, and hard to swallow. Therefore, we must use expressions that others may see love coming along with the reproof. To reprove and yet love is to act both the serpent and the dove. To understand worldly affairs is the wisdom of the serpent; yet to not neglect the truth (that includes consideration, impartiality and sincerity, etc.) is the innocence of the dove. So how do we get so smart - so shrewd? 2) You cannot argue a case that is someone else's conviction as well as we can argue our own conviction. This requires we study issues and view the evidences for and against it ourselves - giving us convictions we can explain and support. Do not let "others" tell us what we are thinking in order to be pleasantly agreeable. We should explain what we think ourselves. Small alterations in the language people use can make mountains of difference in the perception of us by others. Those small deviations are crucial in others determination of who we are - and thus they affect our credibility. Don't concede to another person's "lingo" unless it is our own, because groups hide special implications within their "code words". Break issues down to a language whose words we, and our listeners, understand and then describe what we favor and/or don't favor - so that it is clear to us and the person we are talking to. This will at least lead to a reasonably accurate, if not open, discussion. Remember that we are actually a soldier fighting in a war that involves mankind but is not between mankind - so we must not play "SMART" of "COY" or we'll be outsmarted. We must be informed and honest. We are not to be gullible pawns or deceitful connivers. We must find balance between wisdom and vulnerability in accomplishing God's work through us. (A warning) If you select one sin over another to concentrate your arguments on, you had best understand why. If the bible does not differentiate, know why you do. See Matt 15:19 (evil thoughts, murder, adultery, sexual immorality, theft, false testimony, slander). All sin, every sin, carries the same penalty. I can't finish this lesson without my favorite parable about being wise and thoughtful. Recall the story of the bridesmaids with their lamps (Matt 25: 1-13) While all the virgins carried oil in their lamps, only half their number carried additional oil for the unexpected case where the bridegroom would be late. This was a deadly mistake. "To say you are doing your best is of little use when you must succeed at doing what is necessary." Our lesson today has been full of necessities. When were we more Godly than today and when were we less Godly than today? It is natural to want to identify with success and distance ourselves from failure and embarrassment and to avoid difficulty. This is why people undergo memory alterations as time passes and why we selectively forget inconvenient knowledge and replace it with more palatable recollections. But if we don't know our true national history, we won't be able to recognize the way in which America is drifting. If we don't have enough basic information to manage our lives, we will give up our freedom (and the Gospel is a message of Freedom) to those who promise to take care of us. By boldly engaging in honoring THE TRUTH in communications with others we will thwart the ambitions of ruthless men who wish to divide us and make us a less Godly nation. and we must 3): Pray for and act with good judgment founded on righteousness and truth (which is love) - being wise and brave, innocent of self ingratiation - judging every case, cause and situation without prejudice. This finishes this morning's lesson - and now we must leave here and put our faith into practice before the world. But before we do, we want to provide an opportunity for anyone needing the prayers of the church to come forward request them. This is also the opportunity to come forward to be baptized into Christ's body. We also would like to encourage anyone who would wish to join this group of the Lord's body at First Christian in De Queen to come forward and place membership with us. We encourage you to come as we stand and sing the song that has been selected for this invitation time.